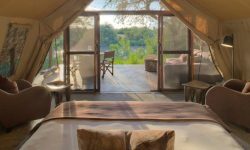 &Beyond Grumeti Tented Camp is set in the remote Western Serengeti and offers one of the best wildlife experiences in this incredibly picturesque area, which enjoy fewer tourist numbers than many other parks. The camp is situated on a by-water of the Grumeti River, known for its dramatic wildebeest crossings and enormous Nile crocodiles. Tucked into a strip of riverine forest, guests thrill to the antics of the hippo resident in the tranquil pool in front of the camp and the spectacular pied colobus monkeys, found nowhere else in the Serengeti. Every year, in June and July, Africa’s renowned Great Migration passes through the Grumeti region and hundreds upon thousands of wildebeest, zebra and other herbivores cross the Grumeti River, risking the jaws of some of Africa’s largest crocodiles. During the remainder of the year, the area offers exclusive game viewing far from the crowds, with the open Western Serengeti plains attracting the elegant cheetah and large prides of lion, as well as clans of hyena that number up to a hundred individuals. The riverside thickets are the ideal dwelling place for leopard and elephant. This area also lies in the path of the annual movement of exceptional numbers of topi antelope. 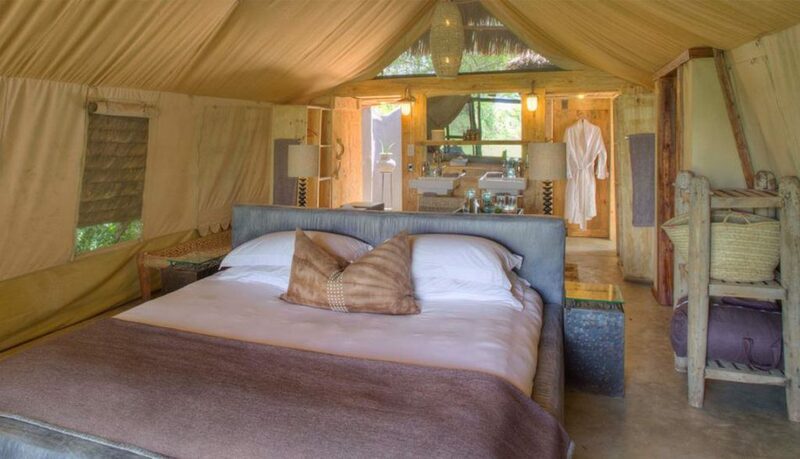 Rustic yet sophisticated, the tents combine hues of wildebeest grey with accents of natural stone and bone, as well as bleached cypress. Whimsical interiors provide quirky touches that emphasize the natural beauty of the setting. 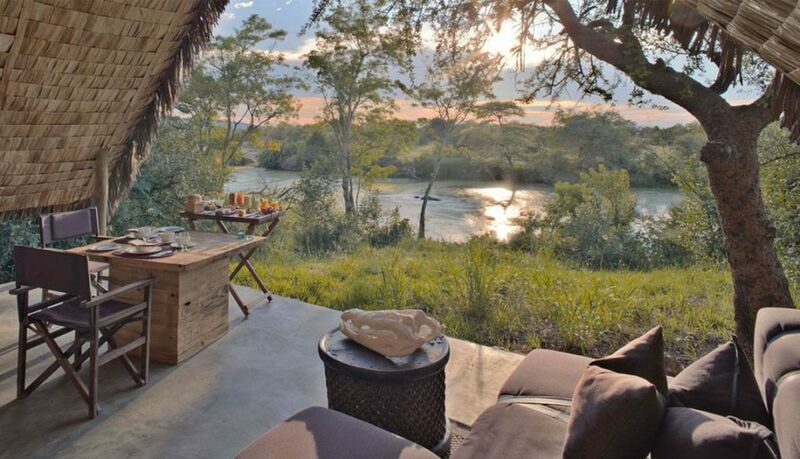 All 10 of the tented suites feature shaded private decks that look out onto the Grumeti River and its resident hippo. Stone shower towers are open to the sun and stars. 2 of the tents cater for families travelling together and are connected by an enclosed walkway that allows easy access between the tents while maintaining complete privacy. be enjoyed on an extensive deck with beautiful views of the river. The dining area opens up to a traditional African boma, where dinner is served beneath a billion stars as traditional jikos ( res) and outdoor ovens produce mouth-watering aromas. Intimate guest areas include open-fronted sitting and dining areas, as well as a domed bar, all adorned with beaded artefacts. The spacious decks are perfect for enjoying sundowners overlooking the water and the camp’s rim- flow swimming pool provides a view of the hippos lazing in the river.